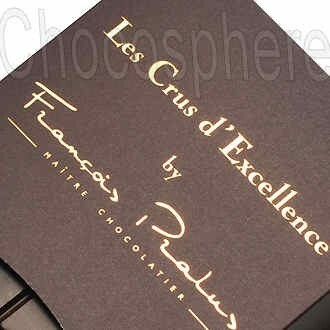 François Pralus offers three of his premier 75% cacao dark chocolate bars in the Les Crus d'Excellence assortment. Venezuela's Porcelana, Cuyagua and Chuao cacaos are considered by many chocolate aficionados to be among the finest in the world! Pralus turns these wonderful cacaos into a delightfully excellent chocolate tasting experience. There is one 50g/1.75oz individually-wrapped chocolate bar of each type in the assortment box, 150g/5.29oz total net wt.